No. 19/20 Virginia Tech defeated No. 3 Duke 77-72 in Cassell Coliseum on Tuesday night to improve to 22-6 overall and 11-5 in the ACC. This marks the first time the Hokies have won 11 regular season ACC games, and it’s the third year in a row they’ve defeated a top five Duke team at home. The Blue Devils dropped to 23-4 overall and 12-3 in league play. Once again the Hokies were led by redshirt junior center Kerry Blackshear, who had 23 points and 10 rebounds. He was 7-of-11 from the field and 9-of-11 from the free throw line. Blackshear is averaging 20.5 points and 9.4 rebounds in the month of February, and he has three consecutive double-doubles. Blackshear has been getting a ton of credit from the ACC media for his performances this month, and he’s sure to get plenty of votes for All-ACC First Team at the conclusion of the regular season. However, he stayed modest when addressing the media after the game. This time Blackshear got some serious offensive help from a number of his teammates. Ahmed Hill had 17 points and was 5-of-10 from the field, while Nickeil Alexander-Walker flashed a very good floor game. Alexander-Walker finished with 13 points, six assists, five rebounds and four steals. He had just one turnover against a Duke defense that likes to pressure the ball. Ty Outlaw chipped in with 11 points, while Wabissa Bede had eight. As a team, the Hokies had just six turnovers while forcing 12 Duke miscues. They outscored the Blue Devils 13-6 in points off turnovers, 9-5 in fastbreak points, and 26-24 in the paint. Duke did shoot 50% from the field, but proved once again to be not quite good enough from three-point range, going just 7-of-21 (33.3%) from the outside. Tech was 23-of-50 (46%) from the field and only 8-of-26 (30.8%) from three-point range, but they won the game at the free throw line by going 23-of-29 (79.3%) including 16-of-19 (84.2%) in the second half. Duke was 15-of-19 (78.9%) from the charity stripe, but they didn’t get there nearly as much as the Hokies. Virginia Tech didn’t control the game, but they led for the majority of the 40 minutes. Duke could never muster a lead of more than one point, while the Hokies led by as many as seven. Tech held a 37-34 lead at halftime, but at that point future top five pick RJ Barrett had just four points and was only 1-of-7 from the field. Things were likely going to go better for Barrett in the second half, and they did. He finished with 21 points on 8-of-15 shooting, and he made numerous critical shots when it looked like the Hokies were just about to make a run and pull away. Duke rallied twice in the final eight minutes to tie the game, but each time the Hokies responded with a big shot out of a timeout. First it was Wabissa Bede with a three-pointer from the corner at the 7:14 mark to put the Hokies up 62-59. The second was the most important one, and it ended a late Duke run. Trailing 70-63 with 3:41 left, Duke went on a 7-0 run over the next two minutes to tie the game at 70 with 1:51 remaining. Buzz Williams called a timeout to set up a play, and Bede found Ty Outlaw for an open three-pointer to put Tech up 73-70 with 1:28 remaining. The Hokies got a stop on their next possession, then missed a three-pointer with 30 seconds left. However, Kerry Blackshear grabbed the offensive rebound, and the Hokies got the ball to Nickeil Alexander-Walker, who was fouled and made two free throws to extend the lead to 75-70. After a layup by Duke freshman Tre Jones, Kerry Blackshear closed out the game with a pair of free throws with 11 seconds remaining, and the Hokies won 77-72. Those key timeouts used by Buzz Williams stopped the Duke runs, and the Hokies responded with a three-pointer both times, though the main focus of the timeouts was about defense. “We just talked about defensive stops,” Ahmed Hill said of the timeouts. “We talked about being in the moment right now…we didn’t talk about offense at all, it was mainly about defense. 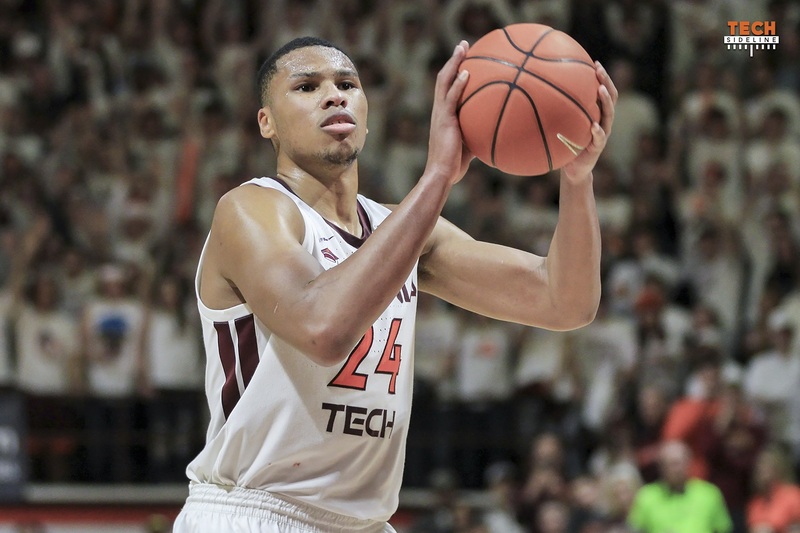 Tech improved to 5-3 on the season without Justin Robinson, and picked up a much-needed fourth Quadrant One win for the NCAA Tournament committee to consider when they seed the Hokies. Justin Robinson did not wear a walking boot for the first time since his injury, and Ahmed Hill noted after the game that the team does expect Robinson back. North Carolina defeated Syracuse Tuesday night to help keep the Hokies in sole possession of fourth place in the conference. Virginia Tech will have the weekend off before returning to action at No. 17/18 Florida State next Tuesday night. Tipoff is scheduled for 7pm, and the game will be televised by ESPNU. The Hokies entered the game ranked 20th in the AP Poll and 19th in the USA Today Coaches Poll. Kerry Blackshear led all scorers with 23 points. He also grabbed a game-high 10 rebounds. It is his seventh double-double this season and 11th of his career. It is his third consecutive double-double. Blackshear has now scored in double figures in 21 games this season and has scored at least 20 points in seven games this season, including the last four games. Ahmed Hill scored 17 points, his 18th game in double figures this season. Nickeil Alexander-Walker scored 13 points and had six assists and four steals. He has scored in double figures 24 time this season. Ty Outlaw scored 11 points, the ninth time this season he has scored in double figures. The Hokies have now defeated Duke in Cassell Coliseum in each of the last three seasons, the first time that has happened. Duke has been ranked in the top 5 in each of those three games. 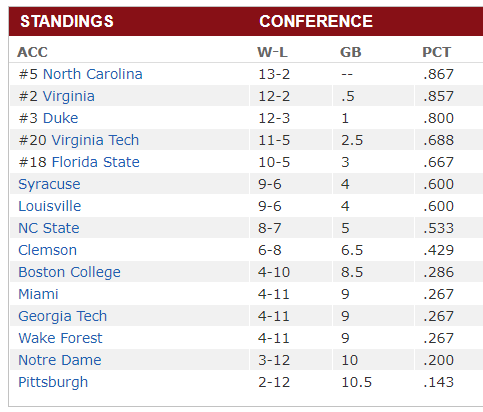 The Hokies are now 22-6 overall and 11-5 in ACC action. Feb. 26 is the earliest the Hokies have ever reached 22 victories. The 11 ACC wins this season is the most for the Hokies since joining the ACC in the 2004-05 season. This is the first time a ranked Virginia Tech team has defeated a ranked Duke team. This is the second consecutive season that the Hokies have defeated Duke on Feb. 26. Tech is now 3-1 against Duke on Feb. 26, including a 64-60 Tech win over top-ranked Duke on Feb. 26, 2011 in Cassell Coliseum. Virginia Tech is now 3-18 all-time against teams ranked No. 3 in the AP poll. Tech’s last win over a third-ranked team was on Saturday, Dec. 12, 1964, a 69-64 win over No. 3 Vanderbilt in Cassell Coliseum. Tech is now 1-2 against Duke when the Blue Devils are ranked third nationally. The Hokies have now defeated at least one Top 5 ranked team in each of the last four seasons. Great to see Bede gaining confidence in his shooting. In a weird way, JR’s injury has helped this team develop as a team. Add back in JR, and we have a very potent squad heading into March Madness. Crazy exciting! We didn’t even have a great shooting night and still won. (We would have easily beaten UVA with last night’s shooting %) We just needed Hill and Bede to contribute offensively and they finally did. No one went 1-9 or 0-7 shooting. If I recall JR only started shooting the ball well the last couple of games before he went down. Am I the only one that wonders if he will be back to where he was in his first game or two back? Of course we are better with JR but don’t forget we played terrible at GT, lost to UNC and UVA by 20 and to PSU with JR playing. So, that makes me even more impressed with what we have done in his absence. Our biggest loss has been 8 points. I would have never thought we could play this well without JR. Credit to players and BW. When I saw how well Barrett played in the 2nd half, essentially creating his own shots, I feel like there is a noticeable gap between him and NAW. NAW does not seem to be able to create his own scoring opportunities. He was very strong the first 8 ACC games with JR. But, his overall ACC stats are not that strong. And here are his stats in the last 8 games w/o JR. 12.7 ppg, 33% FG, 31% 3pt., 71% FT, 29 assists, 29 turnovers, 14 steals. Is he still 1st round pick material? There are no strengths in those numbers. I get the unselfish, team player, intangibles stuff but at some point you need to produce. I know it’s a pipe dream but I am still hoping he sees upside to coming back one more year. Polish his PG skills and add some weight. Kudos to BW for the maroon tie and maroon backside on his vest! Wear those Hokie colors proudly! If Buzz wants to coach closer to his old home so be it but I assume that we will pay whatever is needed to keep him if money is the key issue. If not we are just being stupid. Yeah…..I wish everyone and the media would stop blowing in his ear. Even before last night, I have felt NAW needs to definitely return for another year so he can be a strong 1st rounder. NAW shows many weaknesses like forcing too many bad passes, poor clock mgmt., poor ball security, missing or taking poor shot selections at key moments when the team can really break the opponents’ neck. I would love to see him spend 1 more year to mature in these areas. I love the kid but we will soon see if the McDonalds All-American can take constructive counseling and show constraint. Agree – were you at the Hokie Alumni event here in Atlanta this past Monday? I wondered if any TSL subscribers were there. 1) J-Robb always heats up at that point of the season and into March. It’s called being clutch. If he did it even as a true freshman, I’m fairly sure he’ll be good during his last hurrah. 2)Yes, there is a noticeable gap b/w NAW and Barrett. There is a noticeable gap b/w Barrett and every player in the country except Zion. That’s why RJ might be the number overall pick. RJ is going to lead the NBA in scoring one day (wait until his 3-pointer develops). Finally, NBA scouts are kind of into potential…on potential alone NAW is still a first-rounder. He can develop all those skills better in the NBA. His draft stock won’t go up more than 5-10 picks if he stays and kills it. Will only go down if he does anything besides kill it, scouts aren’t as cool with “old”. I really hope he stays, but I am not getting my hopes up. 3)Buzz has never consistently worn any of his teams’ colors. If he wanted to coach closer to home he would have left by now. His daughter is a junior in high school (she’s done all of high school in bburg) I don’t think he is going to move before her senior year. His son is a junior. Once they graduate, who knows. In any case, I don’t think money is Buzz’s ultimate motivation for any decision–after all, he took a pay cut to take over a really, really bad VT team. Great win, and Buzz is a very good coach, especially considering a 6-7 man rotation, but I would not want to be the sideline reporter who has to interview him. The dude is strange! He doesn’t answer the questions, he stares off into the distance, he pontificates. Last night he asked the reporter if her jacket was suede or velour??? He certainly is strange. That said, his comment to the reporter about the jacket was hilarious. Even the talking heads back in the ESPN studios thought it was great. I don’t think he was impolite. Who cares if he’s a bit out there? Dude recruits and WINS. There was nothing impolite about what he said! People like you need to take a little starch out of your undies and lighten up. I enjoy Buzz as does my wife instead of a lot of these coach speak broken records. Coach has a real TEAM here. Amazing to watch how this team works together even though their roles could change from game to game. Amazing job by the whole program. These guys will have a lot of good memories of this season. GREAT WIN!!! Everyone stepped up in a game where everyone needed to step up. Love that Med is attacking the baseline now. He shoots well enough from the outside that defenders need to close out, so with a pump fake and lightning quick first step, he is finding a lane to the basket along the baseline. Once JRob gets back, we’ll be able to space the floor even more, creating more opportunities for Med to drive the baseline or make weakside baseline cuts for backdoor oops. Plus, his D has been superb. Look like he’s found his role as our emotional leader, defender, and energizer with his ability to get to the rim. For anyone at the game, how was the atmosphere/crowd? Great atmosphere last night! Students showed up early and were awesome. And the student who hit the half court shot at half time was pretty cool as well! Solid performance by the Hokies. Can’t lose focus on the last 2 games. Only a “solid performance”?? Not sure what you’re watching. I thought it was a GREAT performance. Perhaps your definition of “solid” is different than mine. I thought it was solidly great myself. But what do I know? Hope Coach K doesn’t poach our Buzz as one of his assistants. Also think about a medical redshirt for JRob, and another year would be sweet. JRob has played too much and too far into the season for a medical redshirt. I’m assuming your first sentence is a huge joke, right? Such a great win for the Hokie Nation. A big time win on a big stage. Great job by Buzz and his staff, the players (who all contributed) and the fans who were loud all game long. To beat the #3 team without your point guard speaks volumes about how dangerous this team can be on any given night. Beat FSU! 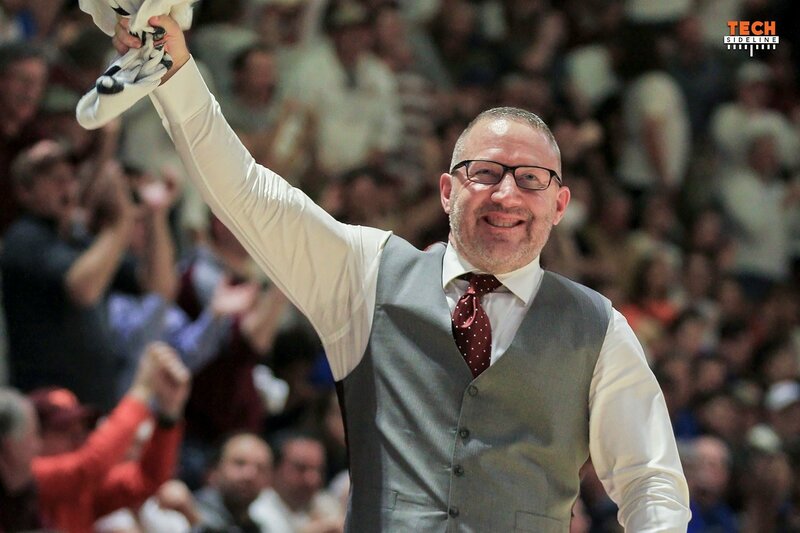 buzz williams is the acc coach of year. you can see that this team is steadily improving after 5 went down. it takes great coaching to do that. I can’t agree with these thoughts more! We need to really acknowledge and celebrate how great of a coaching job and coach Buzz is for us. Here’s to hoping we can keep him around and satisfied as a coach for the Hokies for the next 5 years. Assessing things right now, I think two more productive seasons like this one that continue to keep Tech building a program that is weekly ranked in the Polls and ranked Top 5 or better in the league…….I am expecting Tech will win an ACC Championship very soon and/or get to the Sweet 16 or better within the next 3-5 years or less. Mark it down. If J-Robb comes back, ACC Championship and Sweet 16+ are in play this year. The recruits coming are nice, especially if we add McNielly’s (sp?) nephew. “Duke was 15-of-19 (78.9%) from the charity stripe, but they didn’t get there nearly as much as the Hokies.” …did you mean in the 2nd half? because they got there exactly as much as we did. aw hell, where’s the delete button?